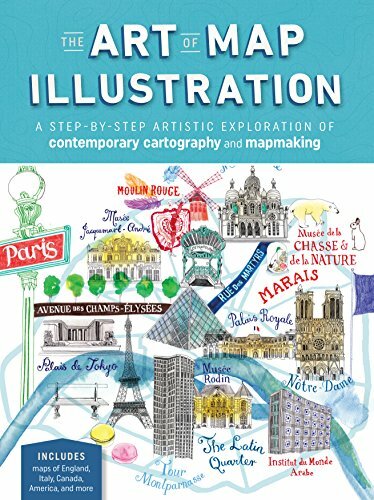 This is a fun instructional book on how you can create your own illustrative maps. This book has ideas on all the different things you can draw and include in your maps. It also talks about the different types of maps, how you can use elements of the maps and match them with other design elements. There are several tutorials included and they were written by artists Hennie Haworth, Stuart Hill, James Gulliver Hancock and Sarah King. You can see the different styles of maps the artists create and how they interpret maps. The tutorials are mostly mixed media art projects but there are some digital tutorials as well so you'll need some software to complete those lessons. But you don't really have to use the same software because you can just apply the techniques you've learned with other software. The illustrated map examples provided by the artists are beautiful and inspiring. They look really good and fun. If you can complete just one map on your own, I'm sure you'll have a tremendous sense of satisfaction. This book is not about technical drawing so you don't have to follow along strictly. You just have to go with your feel. This book also serves as a nice reference book because of all the beautiful examples included. As someone who's an urban sketcher, I can see myself use some of the ideas to add to my sketches. I also love the mix media style. I'll be using more mix media in my art too, so it's great to see how the style looks like in the hands of other artists. This is a wonderful book for those who want to get creative.